The simplest definition of aromatherapy is “the use of aromatic plant extracts and essential oils in massage or baths.” Here is a little more information about aromatherapy to see if it’s right for you. Many people use aromatherapy (also called essential oil therapy), some for medical reasons, and others because they enjoy the smells that aromatherapy uses. 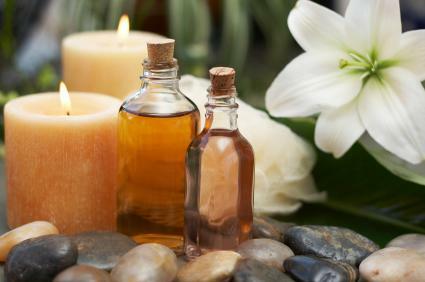 Aromatherapy can be used as a treatment (or possibly prevention) of disease or a skin condition by using essential oils. You can also use essential oils for pain and anxiety reduction, enhancement of energy, relaxation, reduction of eczema-induced itching, and many other uses. Some of these uses are scientifically proven, such as lavender for relaxation. Others are more anecdotal in nature. Aerial diffusion: This way is ideal to use essential oils to make your house smell wonderful, or for aerial disinfection. Direct inhalation: Direct inhalation is used for respiratory disinfection, using as a decongestant, mucus expectoration, and also for psychological effects. Topical application: Topical application is used for applying essential oil directly to the skin. Please note that most essential oils are not meant to be applied to the skin without a carrier oil such as grapeseed oil. If you decide to start yourself on a course of aromatherapy, please make sure that you have cleared it with your doctor. Also, before using essential oils on the skin, you should perform a skin patch test by applying a small amount of the diluted oil behind the wrist and covering it with a band-aid for a few hours. If redness or irritation occurs, the oil should be diluted further with the carrier oil and a second skin test performed, or it should not be used at all. I hope that you found this article on aromatherapy helpful. If you’re interested in using an aromatherapy oil diffuser you can find some very attractive decorative diffusers. DealDash has many decorative sculptures and works of art for auction. Check DealDash before you decorate. Just click this link here and you can browse the auctions on DealDash. Good luck and happy bidding everyone! This entry was posted in Uncategorized and tagged aromatherapy, Deal Dash, DealDash, DealDash Auction, dealdash auctions, dealdash.com, decorate, decorative on November 4, 2016 by . Welcome to DealDash’s Halloween Craft Series. Over the next few weeks I will be posting blog articles of various Halloween-related crafts that you can do with your kids, grandkids, or even by yourself! Today’s craft is handmade treat bags. 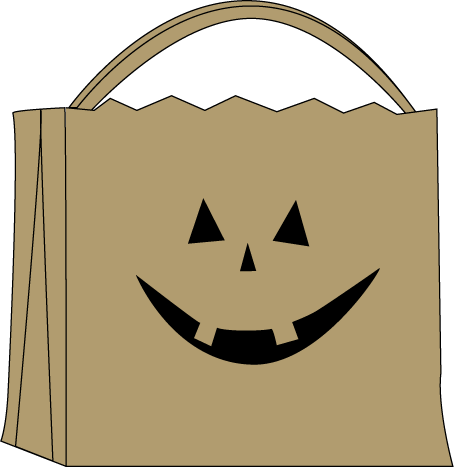 Whether you’re going trick or treating with children, or staying home and handing out the candy it’s more fun to have a handmade bag! They are great for storing the candy if you’re the door-opener, or for taking around the neighborhood and ringing door bells. Read on for a couple of different styles of treat bags that are fun to make and cute to look at! Decorate a plain fabric tote with cereal box stencils and kid-friendly sponge painting. 1. Cut the front and back off of your cereal box. 2. Using the above shapes template you can cut & paste the picture, and enlarge it on your computer to print out. 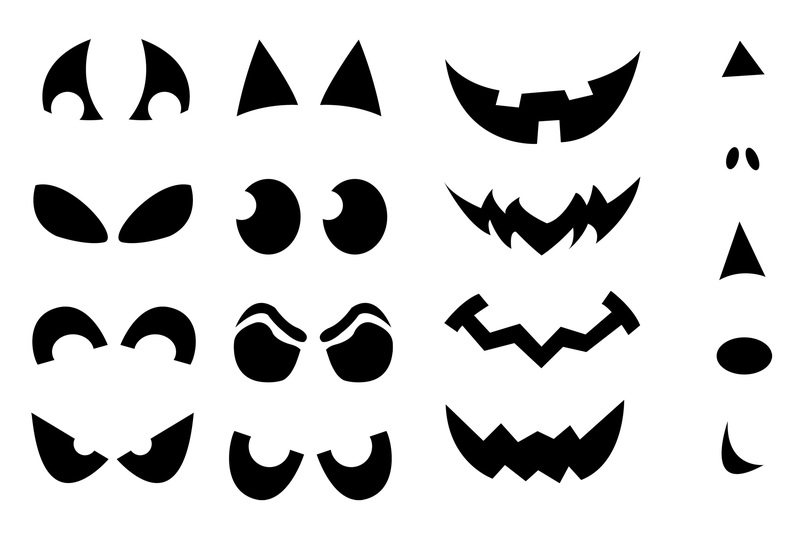 Cut out jack-o’-lantern shapes with an exacto knife on a safe cutting surface. You can most likely do this on your garage floor or driveway, put down an extra thick piece of cardboard from a bigger box under your cereal box and cut away! 3. Next, tape your cardboard stencil to the fabric bag and gently dab on the craft paint using your sponge, peel off stencil, let dry for at least an hour. You can make it dry faster by using a hairdryer on a low setting. Don’t use the higher setting because it could move your paint. 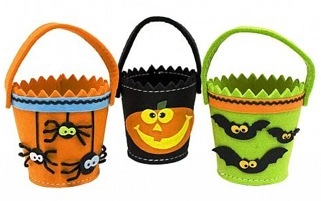 These are great buckets to keep the candy in that you will be handing out at the door. 1. Apply the felt to the bucket using the hot glue gun. Cover the entire surface around the outside. Use more than you need to, and cut off the excess. 2. Glue your ribbon to the top and bottom of the bucket so that you cover up the felt edges. It just looks much nicer and more “put together” this way. 3. Tie contrasting colored ribbons on the handle. 4. Stick on the fun foam shapes to decorate your bucket. These foam shapes usually have a sticky back, but if you would like to reinforce your foam shapes, just use a little hot glue from the gun. I hope that you enjoyed our first Halloween crafts article. DealDash has some great craft auctions such as sewing machines, sergers, and more. Visit DealDash to see the craft auctions. Just click this link here and see how much you can save. Good luck and happy bidding everyone! This entry was posted in Uncategorized and tagged crafts, Deal Dash, DealDash, DealDash Auction, dealdash auctions, dealdash.com, decorate, design, family, fun, Halloween, holiday, kids on October 3, 2016 by .